The East Midlands: An Excellent Investment Opportunity! The Rt. Hon. Greg Clark MP, Minister of State (Cities & Constitution), and Toby Perkins MP, Shadow Minister for Small Business and Enterprise attended a joint reception to promote ‘Local Growth in the East Midlands’ on the 10th December in Westminster (4.00pm-6.00pm). The event, which was Chaired by Cllr Paul Bayliss, Leader of Derby City Council, was organised by EMC, the East Midlands All Party Parliamentary Group and LEPs, and gave Greg Clark and Toby Perkins the opportunity to hear from a range of high profile speakers including Cllr Jon Collins, Leader of Nottingham City Council and Chairman of EMC, regional MPs Chris Heaton-Harris and Jon Ashworth and Peter Richardson, Chairman D2N2 LEP, on why the East Midlands has huge potential for export-led growth. The East Midlands - An Excellent Investment Opportunity! EMC has agreed a 10% discount for its members wishing to undertake one or more of three one-day courses being offered by Nottingham Business School. The first Economic Assessment equips delegates with how to source and utilise statistics appropriate for use in the production of economic assessments. The second Economics for Evaluation will give non-economic specialists a functional understanding of key economic concepts and data involved in economic impact evaluation. The third Successful Bid Writing is aimed at non-specialists who need to deal confidently with the economic aspects of bid writing. All three courses are suitable for local government officers at all grades and will be charged at £247.50 + VAT each (with EMC discount applied). For further information on when these courses will next run go to www.ntu.ac.uk/nbsshortcourses or contact elizabeth.hustlerwraight@ntu.ac.uk. This Employment Land Study (ELS) Source Book is aimed at bridging the gap between past work on Employment Land in the East Midlands, and supporting local authorities in adapting to the requirements of the National Planning Policy Framework (NPPF). The document is prepared like a toolkit, offering a process that can be followed as best practice, with advice and recommendations on how a collaborative approach could benefit work. 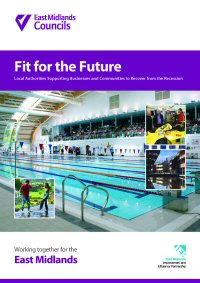 The Source Book can be used by individual local authorities or jointly by local authorities working in cooperation. There will be elements that will not suit some local authorities in how they wish to pursue ELS. This Source Book aims to be comprehensive in covering all aspects in ELS preparation. The report finds that the recession hit communities and businesses increased demand for services and its impact on public finances has increased the pressure on Councils’ budgets. Councils across the region have undertaken a huge range and variety of activity to support communities and business to recover from the recession. Activity ranged from small projects to ambitious multi-agency partnerships. Not everything that Councils have done has been universally effective, but all Councils have responded. The report does not identify one approach to supporting the local economy that would be replicable in every area, but we have uncovered a wealth of good practice that every Council can learn from. Economic circumstances and the challenges Councils face continue to change and Councils will continue to develop new and innovative ways of responding. This report can only be a snapshot at one point in time. There is scope for local authorities to work together to continue to share good practice in supporting local economies. 10/04/2019A new era for train travel in the East Midlands!